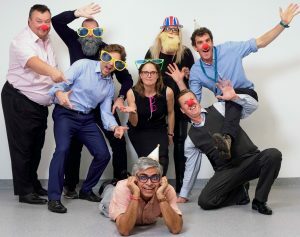 Funny Business – Standing up to Cancer in Sheffield. Seven very brave Sheffield business people took on the challenge to raise money for Weston Park Hospital Cancer Charity by delivering their own 10 minutes of funny to a sold out audience at Sheffield Memorial Hall. The ‘talent’, with no previous stand-up experience, were mentored for 5 weeks by Alfie Moore – himself a Sheffield lad and patron of the charity – before taking to the stage to perform at the Funny Business evening on 30th November. Dr Kash Purohit, Consultant Clinical Oncologist in Sheffield – dubbed as Kash Milligan by Alfie for his truly ‘off the wall’ comedy style, was chosen as the winner but all the contestants put in superb performances and raised over £30,000 for the charity. All monies will go to help improve the lives of people living with and beyond cancer. Funny Business has now raised over £160,000 to help people living with cancer in the Sheffield region. You can still donate by texting FUNI17 £5 to 70070.